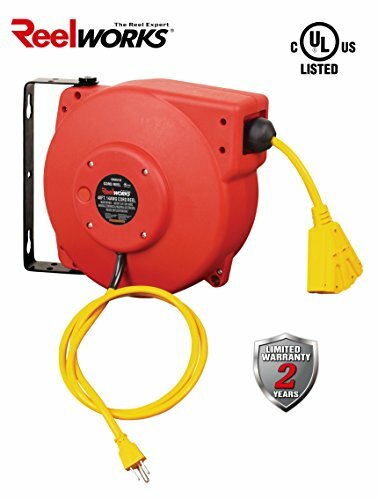 ReelWorks Heavy Duty Extension Cord Reel With Swivel Bracket , 14AWG/3C SJT, Triple Tap, 40 ft. The Reelworks CR605132S3A cord reel features a 40 ft., 14 AWG/3C SJT, Triple Tap cord that allows you to have electric power whenever and wherever you need it. The spring driven retractable feature with latch keeps the cord where you want it during usage and quickly store it away when finished. The impact resistant polypropylene case with attached swivel bracket allows the unit to be mounted on a wall or ceiling; helping you keep the electrical cords out of the way when not in use. One 60 inches lead-in cord is included.